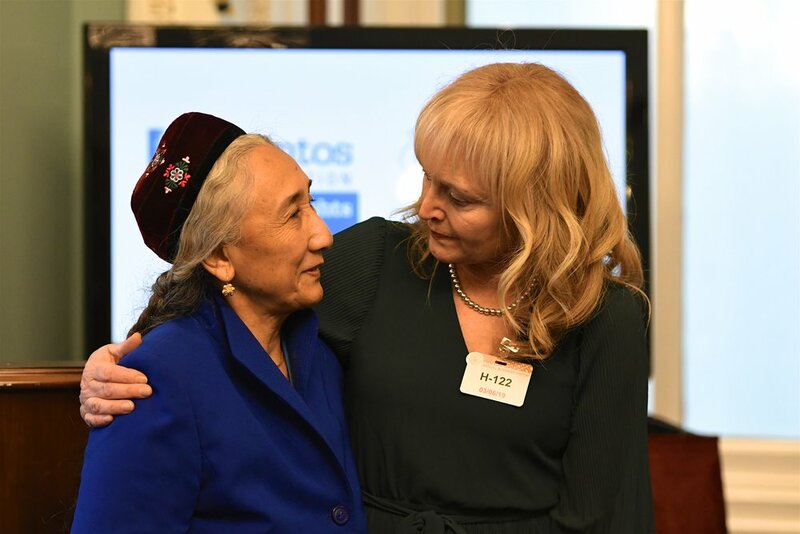 Rebiya Kadeer, known as the acknowledged global leader of the Uyghur people, will read a statment from Lantos Foundation President, Katrina Lantos Swett, during tomorrow's Rally in support of the Uyghur's. 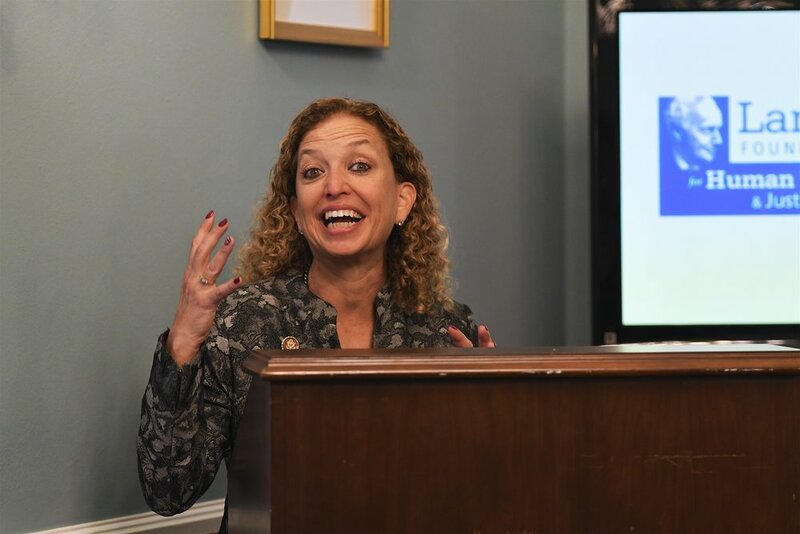 WHO: Members of Congress, human rights leaders, Uyghur Americans, representatives of Muslim, Christian, Buddhist, and Jewish faith communities, concerned citizens. Join us April 6th to add your voice to those urging swift action by the U.S. Congress, U.S. Administration, and the international community. The Uyghur Human Rights Policy Act (H.R. 649 & S. 178) and the Uighur Intervention and Global Humanitarian Unified Response (UIGHUR) Act (H.R. 1025) are currently pending in the Congress. It is time for international action to end Chinese government’s brutal repression of the Uyghur people. The Chinese government has established a militarized police state equipped with cutting-edge surveillance technology in the Uyghur homeland of East Turkestan, and has swept an estimated 1.5 to 2 million people into a massive system of ethnic-concentration camps. Experts have called the persecution of Uyghurs in China “a massive crime against humanity” and a case of “Never Again” happening again in the 21st century. We will be joined by Members of Congress and speakers from numerous civil society organizations including Amnesty International, World Uyghur Congress, Uyghur American Association, Uyghur Human Rights Project, East Turkistan Association of Canada, Campaign for Uyghurs, Uyghur Academy USA, Uyghur Rally, International Campaign for Tibet, Soundvision, and Burma Task Force. the Lantos Foundation was proud to once again take part in the 2019 Anne Frank Award Ceremony where Ben Ferencz, the Chief Prosecutor for the Einsatzgruppen Trial held at Nuremberg, was honored for his historical heroism and his lifetime of work dedicated to the Rule of Law. Ben, now in his 100th year, remains a vibrant force of nature. Katrina Lantos Swett served as the Master of Ceremonies, and is joined (from left to right in group photo) by former US Ambassador on International Religious Freedom David Saperstein, Ben Ferencz, Mohammad Al abdallah (honored with the Anne Frank Special Recognition Award for his work with the Syria Justice and Accountability Centre), Dutch Ambassador Henne Schuwer, and Senator Ben Cardin. Today, the Lantos Foundation and the Middle East Media Institute (MEMRI) published a report entitled The Hater Next Door: Online Incitement Against Minorities in America. This truly horrifying report examines online hatred and incitement in the United States between November 2018 and February 2019 against minority communities including Jews, People of Color, LGBTQ and others. The report exposes the vicious reality of online hatred that is thriving within our own borders, fueled by neo-Nazis, white supremacists, racists and fascists that are not only fellow Americans, but are very often members of our own communities. Unlike generations past, these haters next door can easily hide behind fringe websites and online personas while indulging their most vile impulses with the miracle of the modern Internet. This exponential threat is multiplied when the means for further hate and incitement rests neatly at one’s fingertips via their phone or laptop. The report can be found at www.thehaternextdoor.com. 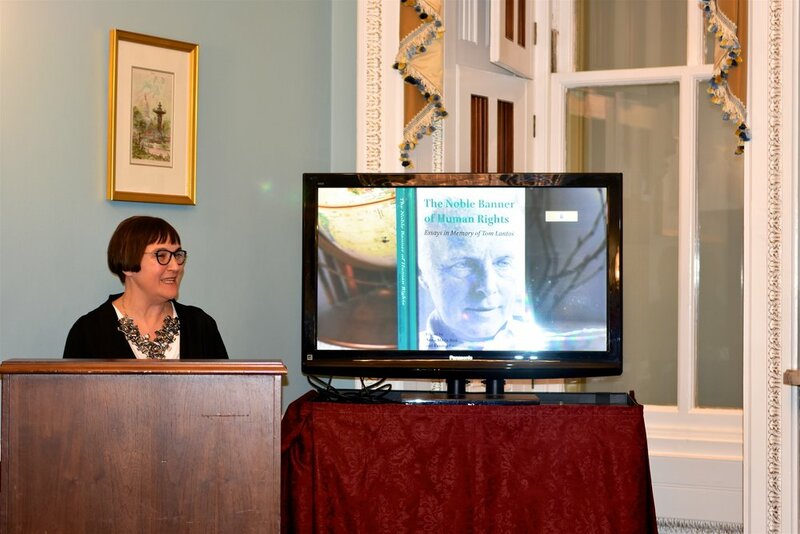 In October 2018, The Noble Banner of Human Rights: Essays in Memory of Tom Lantos was published as a joint project between the Lantos Foundation for Human Rights & Justice and the Budapest-based Tom Lantos Institute. 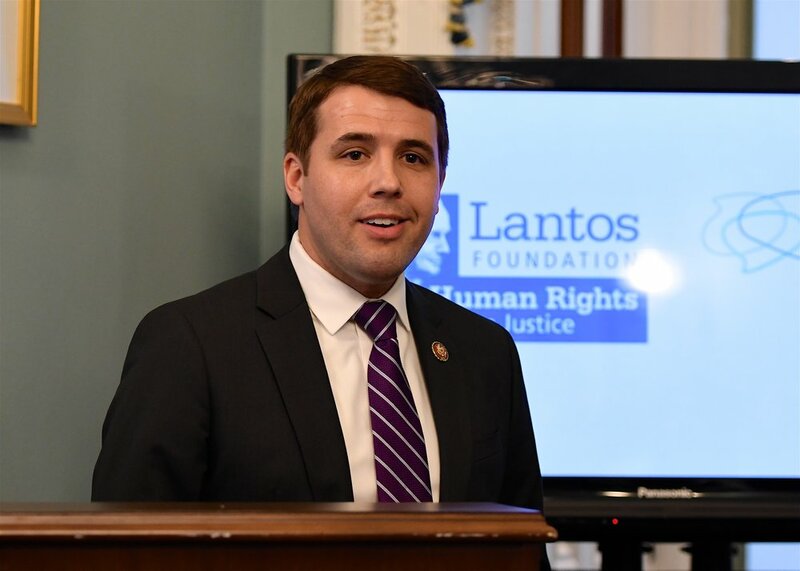 When Congressman Tom Lantos passed away in 2008, he left behind a legacy both as the only survivor of the Holocaust to serve in Congress and as a champion of human rights who founded the Congressional Human Rights Caucus (re-established after his passing as the Tom Lantos Human Rights Commission). This book, published ten years after his passing, not only provides a powerful overview of the late Congressman Lantos’s personal and professional history, but specifically focuses on the human rights issues that defined his career and provides an academic update on a number of issues he championed during his congressional tenure. The US launch of The Noble Banner of Human Rights was celebrated March 6th, 2019 in Washington, DC. Among the many guests, the Lantos Foundation was proud to be joined by newly appointed Special Envoy to Monitor and Combat anti-Semitism, Elan Carr, Anna-Maria Biro of the TLI, Budapest, book contributor Ambassador Robert King, Congressman Jim McGovern, Lantos Prize recipient Rebiya Kadeer, Senator Maggie Hassan, Congressman Chris Pappas, and Congresswoman Debbie Wasserman Schultz. Oryol Court, 2/6/19. 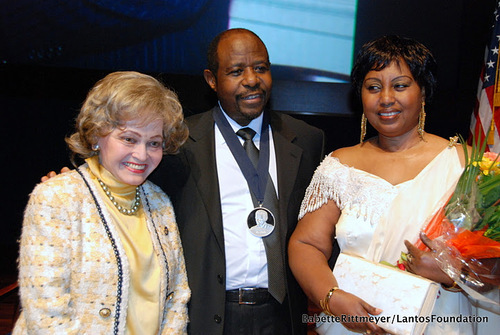 Image courtesy of Jehovah’s Witnesses. Two days ago, Dennis Christensen, a Danish Jehovah’s Witness, was sentenced to six years in prison by a Russian Court for the “crime” of peacefully and faithfully living out his beliefs. This outrageous conviction of an innocent man is the most egregious recent example of Russia’s aggressive attacks against the internationally protected right of freedom of religion, conscience, and belief. Jehovah’s Witnesses have been targeted by the Russian government and their members have been branded as “extremists” simply for practicing their faith.